I've been a loyal Ipsy subscriber for over a year now and I can see how it's so easy for a subscription addiction get out of hand. One of the reasons I love Ipsy is because its a great way to build your makeup collection and get a cute bag each month. When I first started my makeup journey, I didn't realize that I would get so many bags collecting dust so quickly. As much as I love most of the Ipsy bags, let’s be honest, at this point they are just taking up space. Sure, the most obvious repurposing would be to use them to organize your makeup, but today I want to share with you creative ways to reuse your Ipsy Glam Bags that you might not have thought of. As much as I love to claim that I'm an organized person I still somehow have a ton of hair ties and bobby pins that I am always losing because they pretty much just get tossed around. They are in my purse, on my dresser, in a drawer, on the floor and pretty much everywhere in between. Having a bag to put them in makes all the difference! 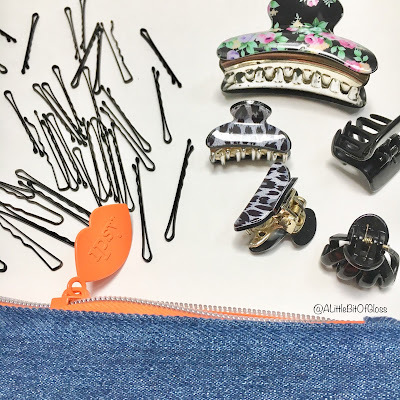 If you like to carry big purses, you know how awful it can be to find items that sometimes get lost in the abyss that is the bottom of your bag! Everything in my purse needs a home — my makeup, my coupons, my snacks, etc. and the Ipsy bags are a fun way to keep everything within reach. You can also stash pads and tampons that might be laying at the bottom of your purse so they're all in one place and easy to locate in case of an emergency. No rummaging through your purse when you are freaking out! If you're a cosmetics junkie like me, you probably have a ton of samples stashed away in a drawer somewhere that you probably forgot about. I like looking through my sample stash to find some goodies for short trips. The Glam Bag is perfect for toothbrushes, toothpaste, floss, mouthwash, and any other essentials you might need for short travels. I'm always one to ask the "what ifs" so I do my best to prepare for emergencies by making emergency kits from the Ipsy glam bags. You can put anything you might want in an emergency- like tampons, spare chargers, mini flashlights, bandaids, matches, floss etc. and stash them in places you might need in the event of an emergency like your car, your desk at work, a friend’s house, anywhere! Some of Ipsy’s Glam Bags are chic, and others...not so much. They're the perfect size for small gifts and look pretty when you add some tissue paper. Set aside the bags you don’t like and save them for birthdays and holidays. You can even throw in some of those samples that you'll never use but would never dare throw away- no extra gift bag needed! I hate getting stuck in a situation where I desperately need a charger or headphones. 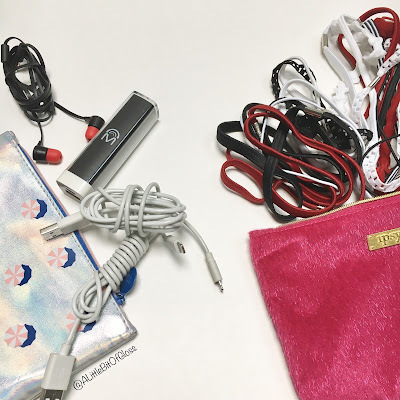 I used to have a charger and headphones just tossed in my purse where they get all tangled and knotted. When I needed them I would get annoyed because they were just a mess. You can use a Glam Bag to hold these wires and help keep them knot free! An easy way to glam up your work space is by keeping all your office supplies organized in a glam bag. Instead of throwing all your pens and paper clips in your drawer to be lost forever, give them their own little bag so you’ll always know exactly where they are.